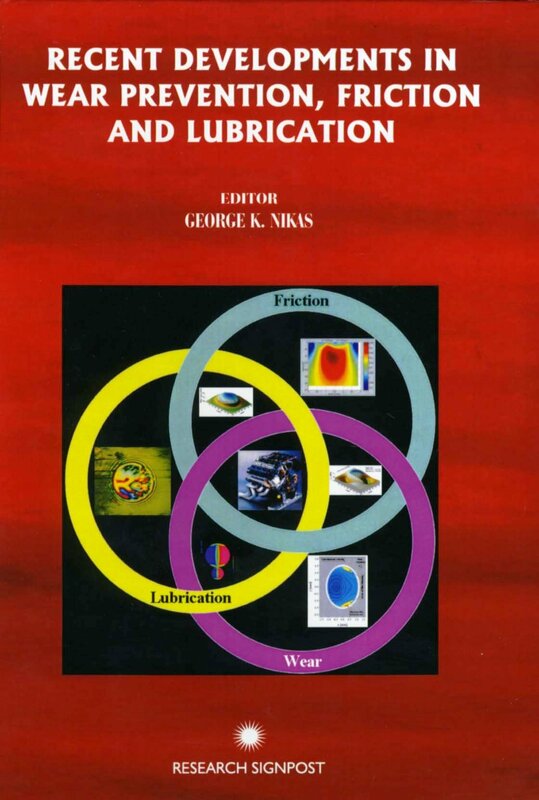 Book: "Recent Developments in Wear Prevention, Friction and Lubrication"
Hardbound; 8 chapters; 326 pages; 11 authors; 9 reviewers. Professor George Adams, Professor of Mechanical and Industrial Engineering; Department of Mechanical and Industrial Engineering, Northeastern University, USA. Professor Liming Chang, Professor of Mechanical Engineering; Department of Mechanical and Nuclear Engineering, The Pennsylvania State University, USA. Professor Rob Dwyer-Joyce, Professor of Lubrication Engineering; Head of the Mechanical Engineering Department, Tribology Group, Department of Mechanical Engineering, The University of Sheffield, England. Professor Ian Hutchings, GKN Professor of Manufacturing Engineering, Institute of Manufacturing; University of Cambridge, England. Professor Emeritus Bo Jacobson, Professor Emeritus; Machine Elements Division, Mechanical Engineering Department, Lund University, Sweden. Dr George Nikas, Research Associate; Tribology Group, Department of Mechanical Engineering, Imperial College London, England. Professor Homer Rahnejat, Professor of Dynamics; Dynamics Research Group, Department of Mechanical, Aeronautical and Manufacturing Engineering, Loughborough University, England. Professor Richard Salant, Georgia Power Distinguished Professor in Mechanical Engineering; Georgia Institute of Technology, The George W. Woodruff School of Mechanical Engineering, Georgia, USA. Professor Ray Snidle, Professor; Head of Tribology and Contact Mechanics Research Group, School of Engineering, Cardiff University, UK.